Segmenting your customers into lists based on demographics such as gender, age, nationality, etc. has a lot of value. But people don't only buy for themselves, and it's not the 1950s any more; so you really shouldn't assume that everyone who looks alike buys alike. The solution is to segment on behavioral data. 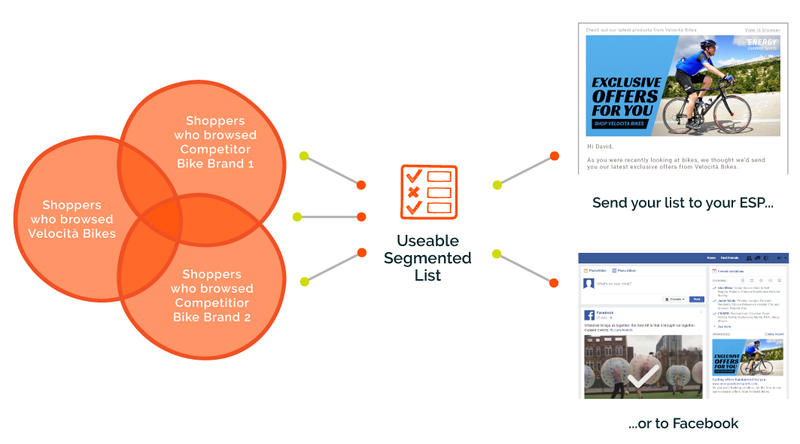 It can be Hard to Create a Segmented List Based on Usable Behavioral Data. Getting data about shoppers on your eCommerce system into your ESP is difficult to say the least. Enter Fresh Relevance’s Segment Builder, which will build you usable lists of customers, segmented using detailed knowledge of their behavior whilst on your website and their shopping activity. It lets you query directly on product groups/categories, and it’s all consistent between browse and purchase data. Easy to use, all in one place and ready to be exported, Segment Builder saves you time whilst creating excellent quality lists. Not only can a list be created of people who have bought a certain product - but also of everyone who has been browsing a certain category of products or brand. This gives you a substantial selection of potential customers for you to grow with an email from your ESP or targeting through Facebook Audiences. Using browse behavior gives you a strong indication of people who are interested in products. Using browse behavior for the right category of product, or similar products, gives you an even stronger indication. Everyone who receives your email will have a genuine interest in it, leading to what we all ultimately want: more sales and increased engagement. We grow constantly so are always improving to match your needs.